Discussions and presentations I've been party to have referred from time to time to an existing resource consent for a tower building in the Downtown Block, on the corner of Lower Albert and Custom Street. But I wasn't aware of that resource consent when I put up this May 16 posting where I roughly positioned a tower based on attending the Council Development Committee meeting where this report was tabled and discussed and which led to Auckland Councillors' 14-7 decision to sell QE Square in principle. Almost uniquely in a city centre context land in the block is owned by only two parties. Precinct Properties New Zealand Limited (PPNZL) owns the DSC and the two adjacent commercial office towers (HSBC Tower, 1 Queen Street and Zurich House, 21 Queen Street) and council owns Queen Elizabeth Square (QE Square). PPNZL recently embarked on a master planning exercise for the properties in its ownership within the DSC block. The initial concept design work suggests basement parking, a three storey street based retail podium with potential roof top space and a 36 storey commercial tower placed on the corner of Lower Albert Street and Custom Street West. Sitting adjacent to the Britomart Transport Centre and the Downtown waterfront the DSC block has long being recognised as having significant latent potential as a major city centre gateway. An extant resource consent granted in 2008 to the former owners of the Downtown Shopping Centre, Westfield Group, comprises a 41 storey commercial office tower and two storey podium covered retail mall. You'd have to have been a very keen and acute councillor to have picked this up, given that the report was received very late in the day, and given that this information came after the Executive Summary, and after the Recommendations. I suspect that Councillors voted without knowing about this resource consent. What's the big deal, you ask? Well. For a start I'd assumed that PPNZL would have had to go through a resource consent process for any new tower, which would've covered issues like shading of QE Square (assuming it is retained), how it affects the waterfront, how it affects views to the waterfront, how carparks might affect public transport services and other traffic movements. Stuff like that. But if PPNZL owns the land, the Zurich Tower, the HSBC Tower, AND a resource consent for a new 41 storey commercial office tower - what further resource consent might be needed? Once the penny dropped, I asked myself this question: how did Westfield Group get resource consent for a 41 storey tower there, in 2008, without any public interest or concern being expressed? And another question: if consent was granted in 2008, surely it would have lapsed by now - most consents are effective for about 5 years - has it lapsed? Not the subject of a contested hearing. How could that be? So I opened up the planning report which runs to 30 pages of sophisticated justifiction for granting consent AND no notification. Would you believe Auckland City Council even engaged the services of the same urban design adviser as was used for the Princes Wharf development - which was also granted and not notified. According to the planning report there were a number of issues with the application including height, verandahs, loading zones and digging out 53,000 cubic metres to provide for basement parking. So the proposed building went through the height control by 20 metres. The length of a cricket pitch. Quite a lot. The control plane is there to protect public spaces and other buildings. Views, sunlight, shading. The building proposed infringes this control. It requires a resource consent because exceeding the harbour edge height plane is a restricted discretionary activity. The proposed building seeks a "double height" lobby - which conflicts with the district plan which seeks to prioritise pedestrian amenity along these frontages - for weather purposes - human scale. All those good things. But the proposed building would not deliver that amenity. It requires a resource consent because double height verandahs are a restricted discretionary activity. This diagram is contained in the planners report. To the left it shows No 1 Queen Street - the HSBC building. To the right is the proposed building outline. 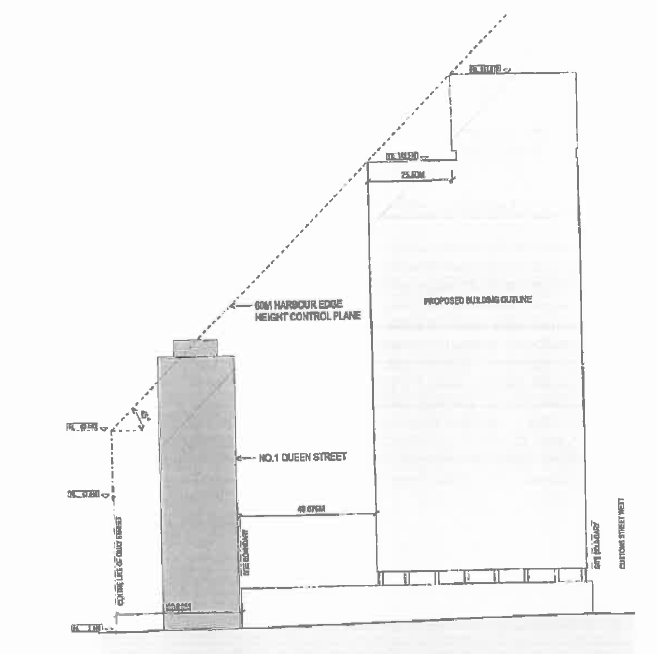 There is no legend with the diagram in the report, so I am not sure what it shows - in terms of the harbour edge height control plan (given that the application exceeds the height control by 20 metres). But the diagram does give an idea of scale. Somewhere down below, at street level is QE Square, Lower Albert Street, and Custom Street. Look again: "...where rules do not exclude public notification...". Which means: "...where rules would normally trigger public notification...."
I won't bore you with the detail. Suffice to say, Auckland City Council staff artfully argue in their report in support of the infringements, and that public notification is not required. The report goes on to argue that because ARTA is not a requiring authority it need not be notified about the application. Man. That's a bit harsh. By the way, the report notes that separate consents would be required from ARC relating to the discharge of stormwater from the site during construction. Remember what happened with the first Britomart application - the Les Mills proposal. It came to grief when ARC was approached to issue a stormwater discharge consent. But I digress. I've discussed this with a few planners. They are appalled. It's only just come to light. One planner advised, "that consent should be judicially reviewed." Which brings me to the end of this post. But not the end of this investigation. This consent would have expired in April 2013 - unless it was renewed. Officers have advised that the consent has been renewed - presumably sometime before April 2013. That renewal would have been done by the new Auckland Council. You might have hoped that the Machiavellian practices rumoured to have been typical of Auckland City Council for CBD projects might have been cleaned out by amalgamation. Dream on. I have asked Auckland Council for information relating to the renewal decision. Watch this space. This bloke is my youngest brother, and the bloke looking over his shoulder is Constable Charles G. Smyth. He was our grand-father. And yesterday (22nd July) the new Boardroom at the NZ Police Trade Union offices (known as The NZ Police Association) was dedicated to him. We learned there that our grand-dad is the patron saint of the NZ Police Association. "Charles Gordon Smyth was born in Oamaru, New Zealand, on 17 April 1883, the son of Irish parents William Smyth, a baker, and his wife, Jane Macaffee. Charles excelled in school and at sports. He worked for some years in his father's baking firm, then in 1912 entered the New Zealand Police Force Training Depot in Wellington. He was appointed a constable on 11 July that year, and after initial stationing in Wellington was transferred to Dunedin on 8 January 1913. In March 1913 Commissioner of Police John Cullen rejected police concerns over pay, discipline and conditions. City-based constables, particularly in Auckland, risked offending against police regulations banning 'combinations' and planned their own union. Government and police authorities, troubled by current industrial conflict in New Zealand, attempted to prevent what they saw as the virus of socialism gaining any influence in the police force. Charlie Smyth, as he was known, arrived in Auckland on transfer on 31 March 1913. There he allegedly told a superior he had requested the transfer in order to help form a union. At the trades hall on 11 April several dozen policemen were helped by trade unionist Arthur Rosser to launch the New Zealand Police Association. Smyth was selected as the Auckland branch secretary. As such he was prominent in drawing up the rules and platform of the new organisation and in liaising with police in other parts of the country. On 25 April Cullen assembled the Auckland police staff and assured them that they had nothing to fear from discussing their grievances. Smyth was the main spokesman for the police unionists and protested when an angry Cullen ended the meeting by inviting dissatisfied constables to resign. The minister in charge of police, A. L. Herdman, and the commissioner then moved to make an example of Smyth whom they regarded as an 'insolent' ringleader. Smyth's role in the association was said to have forfeited him the trust of the Auckland sergeants and officers. On 30 April he was ordered to transfer at once to isolated and rainy Greymouth where police were traditionally posted as a punishment. His comrades gave him a handsome presentation and rousing send-off. In June 1913 Smyth was given four days' notice of dismissal, an obvious invitation to resign. He chose to 'expose' the 'police oligarchy' by forcing Cullen to sack him and then appealing the dismissal. He had allegedly been guilty of abandoning his post when guarding timber on the wharf and of making a false entry in the station book to disguise this. Similar misdemeanours were normally punished with fines or reprimands, and Smyth had both a clean record and evidence to support his contention that he had genuinely mistaken the time. Herdman blackened the constable's name in Parliament and denied his dismissal was connected with his union activity. The appeal was dismissed. The newspaper New Zealand Truth stated that 'though the dogs of war were let loose on Smythe [ sic ], the last has not been heard of him'. Backed by members of Parliament, newspapers and unions Smyth campaigned to clear his name. However, by 1914 his efforts and the Police Association itself had effectively failed. The governing Reform Party was even claiming that Smyth had deliberately entered the Police Force to subvert it and 'secure its adhesion to the Federation of Labour'. By then Smyth had returned to the baking industry in Oamaru. There, on 15 September 1914, he married Rose Mason, a weaver. In Morven, where he set up a bakery after the First World War, the couple were pillars of the local community. Smyth served on committees, played tennis and did charitable works. He died of cancer in Christchurch on 17 November 1927, aged 44. Rose Smyth, who was left with five daughters aged five to twelve, died the following year. Charlie Smyth remained a well-known name in police union circles, and was honoured – accidentally, it appears – when his image appeared on a stamp officially issued for the New Zealand Police centenary in 1986. He was a man ahead of his time, regarded as the patron saint of the modern New Zealand Police Association which was founded in 1936." This information is summarised in the boardroom dedication. It was interesting to learn that he had drawn up a model rule book for the new trade union, and that has become the basis of the rules today. Not only a gentleman - but maybe a scholar. As we left, his image followed us to the lifts. An interesting family occasion. If you've got this far, you might be interested in this Truth Newspaper article which is a fantastic read. And getting a little closer to the man, this exchange below is of letters from him, and criticising him, and even one from his father (my great grandfather) defending his dismissed son. A personal explanation from Charles published in the Otago Daily Times, which also (scroll down) contains The Hon Herdman's, Minister of Justice, critical comments. This is a letter in the Oamaru Mail from Charles defending himself against the Minister's comments. Here is an example of a sub leader in the ODT attacking him, and an anonymous letter. Here is Auckland Star's extracts of what he sent to would-be and current Police Association members. And finally, a letter his dad wrote (scroll down - it's almost at the bottom of the column), in Charles Smyth's defence, in the Otago Daily Times. "...Auckland Council's proposed urban limit policy, the policies underlying a compact city and the political economy of urban policy..."
"...the political economy plays a defining role in Auckland's urban policy. Housing choice was cut back significantly following community consultation. Improving housing affordability and creating greater housing choice require radically new models of planning. Reduced regulations could be exchanged for greater local amenity, improved levels of service, financial compensation or some combination..."
This is the first time I've seen these ideas discussed by Council staff at this level. In public anyway. I agree with Cooper. But I think he - and council - need to develop this thinking and provide implementation policies and tools that can embody this "radically new model of planning" - which, by the way, is the norm for urban development planning policy in OECD countries that have not been totally taken over by free-market rules. Auckland Council’s Chief Economist, Geoff Cooper, calls for “radically new models of planning” to improve housing choice and affordability in Auckland, and argues that housing choice was “cut back significantly following community consultation” over the draft Unitary Plan. Significantly, Cooper states that “the political economy plays a defining role in Auckland’s urban policy”. I agree with him. But does he mean what I think he means with these words? In the western world political economy is typically concerned with interactions between capital and politics and policy making. Urban political economy focuses on the relationship between local government and capital, both local and global. A practical understanding of what these interactions and relationships might be in Auckland is assisted by asking a couple of questions: Who governs, and whose interests are being advanced? More concrete questions include: Do the interests of capital dominate council thinking and exert undue influence in agenda setting and policy making. Are elected councillors and senior officers pawns of capital, or is the relationship more nuanced? For example, do the public’s desires for particular patterns of residential development, work locations, and entertainment preferences set the agenda for capital in a democratic, “invisible-hand” manner? Cooper – correctly in my view – summarises the three matters that need to be weighed in analyzing the effectiveness of the Proposed Auckland Unitary Plan (Auckland’s urban development policy) that is now out for submissions: its urban limit policy; its compact city policy; and its political economy policy. The first arises from a failure to take into account the social value of open space when land is converted to urban use. The second arises from a failure on the part of individual commuters to recognize the social costs of congestion created by their use of the road network, which leads to excessive commuting times for everybody. The third market failure arises from the failure of real estate developers to take into account all of the public infrastructure costs generated by their projects. Additional to the second market failure is the social cost associated with having to travel large distances (compared with compact mixed use development) for life's basic needs including education, shopping, employment and entertainment. Thus, development appears artificially cheap from the developer’s point of view, encouraging excessive urban growth. Auckland Council’s current compact city policy settings need a radical overhaul. Simplification and removal of regulatory red-tape loomed large on Auckland Council’s list of political objectives that have been delivered in its four unitary plan residential zones. Many economic efficiencies can be claimed from a compact city approach including more efficient use of existing infrastructure, and closer proximity for residents to amenities and employment. It’s a good plan. It’s been successful in other Western world cities. And it can be successful in Auckland. But only if its political economy is recognised and respected. The Auckland public easily spotted that Auckland Council's combined policy of Special Housing Areas and upzoned urban neighbourhoods was primarily designed to make redevelopment of existing residential properties attractive to developers. Objections have come from existing residents concerned over impacts of taller buildings on their houses, worries about the capacity of existing infrastructure (roads and schools for example), and fears that the value of their homes might drop because of the perceived impact of intensification. All of these fears are well grounded and would have been foreseen had Auckland Council bothered to investigate the political economy of its compact city policies from the public’s point of view. The first arises from a failure to take into account the loss in value of the existing sense of community and neighbourhood amenity when urban land is converted from detached residential to intensive use. The second arises from a failure on the part of the first-off-the-block developments to pay for (compensate for) the loss of amenity their intensive project is responsible for, while benefiting from the premium of being first. These market failures must inevitably lead to conflict between existing residents and would-be developers. At present Council appears reluctant to recognise this problem, or to do anything about it. Other OECD countries have plenty of examples. These always include explicit public development agency intervention in neighbourhood redevelopment, to get the planning right for the new pattern of land uses, and to build needed infrastructure. Such public actions are either funded by the new development and by a contribution from uplift in property values, or from levies that are charged on greenfield development. Policy shifts in these directions will begin to correct for current failures in Auckland’s urban political economy. It's that time again. Council's Long Term Planning cycle, and you've got to come up with a Draft Long Term Plan, put it out there for consultation, with the media spotlight and microscope looking on closely. I think the scrutiny will be more thorough and more analytical than past years. Ratepayers are more aware of Council's debt level and of proposed rate increases than before, and there's been a lot more media debate and information about the costs of infrastructure proposals. But there hasn't been enough scrutiny - yet - of the policy assumptions that are driving much of what Council does and is planning to do. Previously I wrote about Mayor Brown's request of officers for papers and advice that would enable councillors to examine and question The Auckland Plan's growth assumptions, and their consequences for the city's Long Term Plan. Media commentary so far doesn't indicate that this examination has occurred in Council yet. (BTW: You can hear my NewsTalk ZB chat about all this here (go to 8mins 50 secs), and completed here.) But it needs to. Why? Because under the Council's present policy settings ratepayers can't afford the Auckland Plan, and it's not equitable to require ratepayers to subsidise Auckland's economic growth. In a nutshell, the Auckland Plan calls for two things: it calls for an annual economic growth rate equivalent to a 5% increase each year in the city's GDP; and it presumes the "high rate" scenario of population growth. By themselves these assumptions and aspirations might seem reasonable. But it's not until you look at HOW they will be implemented that you see the problems for ratepayers and for Auckland. In the financial year ended June 30th, Council income was about $1.4 billion in rates, about $1.1 billion in fees and charges (iincluding Watercare revenues), $0.4 billion in grants and subsidies (mostly from Central Govt for transport), and $0.23 billion from other sources. About $3.1 billion income for the financial year all up. While it's difficult to get a big picture feel from council's Annual Plan of how the money is spent, my experience in Local Government suggests that about 40% goes on transport, 30% goes on the 3 waters (water, wastewater and stormwater), and the rest is spent on other services (planning, parks, community services, leisure services, environmental protection, waste management and suchlike). Now the big ticket-items foreshadowed in The Auckland Plan (new network infrastructure projects) need related capital and operational budgets inserted into this new 10 year Long Term Plan. This is deemed "essential growth infrastructure". Deemed "essential for Auckland's economic success..."
It should be remembered that there are some unusual additional costs that must now be carried by Council - for example its share of leaky building damage costs is around $100 million each year - or about 3% of total revenue. But this is much less than the Council currently pays in interest on the debt it has accumulated since amalgamation. Auckland council debt as at 30 June 2014 stands at around $7 billion - of which about $1.5 billion relates to Watercare projects. In the last financial year Auckland Council spent close to a third of a billion dollars ($300,000,000) in interest to its lenders. This is equivalent to 10% of its overall revenue, or about 20% of its entire rating revenue. This was at an average loan rate of 5.66%. This interest rate is subject to change depending on circumstances beyond New Zealand's control. The media chatter this week is largely around "how will we pay for essential infrastucture? ", and "where do you think cuts should be made - should it be swimming pools, parks or libraries? ", and "don't you think the Government should put money into Auckland like it is into Christchurch?" and suchlike. It is likely Council's media advisors can put a tick in their boxes - they are keeping the debate on track. But what if you - Councillors - asked ratepayers whether they would prefer cuts in their local services (parks, libraries, waste management, plantings, gardens, community services), or whether they would prefer you to spend less of their rates on growth infrastructure projects - then I think you'd get a clear answer. Local council and community services are highly valued in a liveable city. It's not that urban growth is a bad thing. By itself. But it becomes a bad thing, an unaffordable thing for existing ratepayers, if Auckland Council makes them subsidise the costs of growth infrastructure. There are several big ticket growth items awaiting funding certainty. Like Watercare's Central Interceptor project, like several new roads and road capacity-increase projects which are the responsibility of Auckland Transport. And there's the Central Rail Link - which can't be built without Central Government's contribution. Maybe Watercare knows something that the rest of us don't know, but I get the strong feeling that the reason it has been ratcheting up its connection fees, and giving strong warnings that water and wastewater rates are on their way up - is because Auckland Council is telling Watercare, "if you want the Central Interceptor, then fund it yourself. Don't expect Auckland Council to raise a ratepayer funded loan for it...." But I don't know about that. Just a feeling. However. Councillors, don't think you can escape responsibility for Watercare charge increases by keeping rate increases down a bit. Watercare is your responsibility too. You govern it. No-one else does. Development Contributions do cover some of the costs of growth infrastructure. But they only make a contribution toward those costs. Auckland Council's current policy settings still presume that existing ratepayers will heavily subsidise those costs. There are arguments in support of that policy - such as that some Aucklanders get jobs building that infrastructure. But that does not justify overloading existing Auckland ratepayers with growth infrastructure costs. I think you would be assisted in your task if you asked officers for typical household scenarios with different policy settings. You should be provided with information at the individual ratepayer level of all the consequences of your plans, policies and assumptions. This would tally up rates AND Watercare charges AND any other Council charges - so you can see the total funding impact of your potential decisions on typical Auckland ratepayers across the region. You probably already get stuff like this, but I'd suggest you get officers to keep it simple and comprehensive so you can share it with the media and with the public. If you feel educated and enlightened and empowered by information provided by your officers, then ratepayers will likely feel the same way. These scenarios need to include an assessment of the true costs to ratepayers - new ones and existing ones - of providing infrastructure for growth, and an explanation of how those costs are covered, and who pays. In the end this assessment comes down to an understanding of who is gaining and who is losing out from Auckland Council's current growth assumptions and policy settings, and allows an evaluation of what is best for most ratepayers. It's not good enough to hide behind a 2.5% average rate increase either - given that inflation last year was less than 1%, and the first quarter of this year was 1.5% - despite the fact that some of your services are inflating ahead of this average. My biggest policy concern with the growth pathway Auckland is headed down (as built into the Auckland Plan) is that because of the assumption that existing ratepayers will subsidise costs of growth infrastructure needed to accommodate new ratepayers, then the true costs of new accommodation will not be paid by those buying into Auckland. This inbuilt subsidy is causing property-market failure. Auckland's property market craziness is being partly driven by Auckland Council growth policies. These need to be examined, challenged and revised by Councillors as part of the strategic review that is now underway. I see two policy options for change: either a further shift of costs of growth onto new development and away from existing ratepayers, or a substantial deferral in the startup and delivery time of big ticket projects, or perhaps a mixture of both of these options. Don't be rushed into decisions.